The House of Representative releases new beta version of the United States Code online. The United States Code is prepared and published by the Office of the Law Revision Counsel (“OLRC”) of the U.S. House of Representatives pursuant to 2 U.S.C. 285b. The Code contains the general and permanent laws of the United States, organized into titles based on subject matter. The Code currently consists of 51 titles and five appendices. The website advises its users to verify accuracy against the print version, even though effort has been made to ensure accuracy of the online database. The online Code database has 51 titles, including Title 51: National and Commercial Space Programs. Users can search or browse the Code. Advanced search offers additional search options, including general term search that can be performed within the entire code or within a specific section of the code, or users can search for a keyword within the following set categories: citation, expanded citation, heading, statutory text, credit, future amendments, reference in text, amendment notes, ED of amdt. notes, miscellaneous, or executive documents. Users may also search for a reference of a specific section within the code. … an advance posting of the next online version of the United States Code. It currently includes only certain titles of the Code, …. Users can also take advantage of classification tables, popular name tool, and number of other tables and tools including cite checker or Statutes at Large (1789-2010). 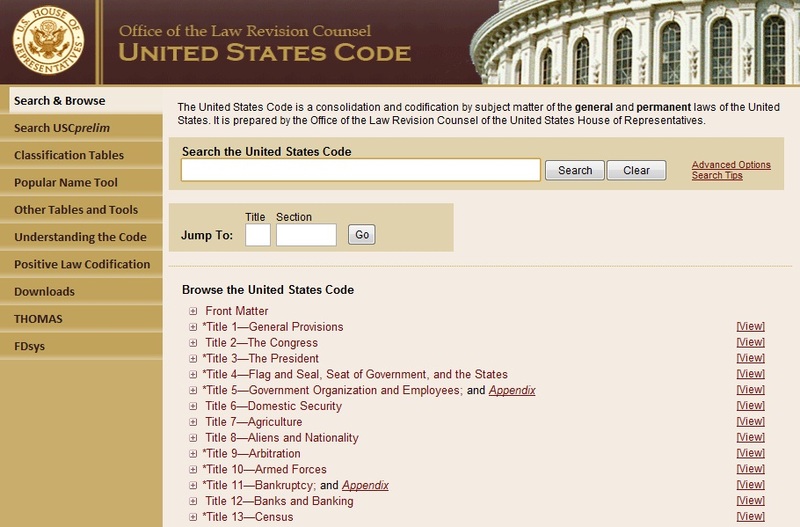 The U.S. Code website includes number of tools to help and assist users to understand the code and how to use it, and cross-links to THOMAS, FDsys. Next Legal Writing: How Many Spaces After a Period?